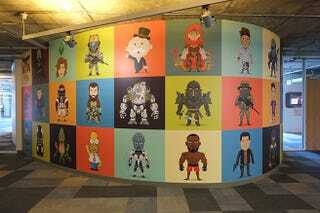 Artist Christopher Lee did this enormous mural that adorns the walls at EA's global HQ. Each panel belongs to a game or series that EA either makes or owns. It's a fantastic piece! Though while surely intended to showcase the company's strengths and hit series (FIFA, The Sims, etc), the fact it also pays tribute to some of EA's less successful ventures (the dreadful Medal of Honor reboots, any basketball project they've attempted lately) must sting a little.